Alabama running back Jimmy Johns was held to 2 yards in the second half by the Hawaii defense last night. TUSCALOOSA, Ala. » This was one effort that, in the final analysis, Jerry Glanville and the Hawaii defense could take some pride in -- or at least consider a good starting point. Although the Warriors lost 25-17 to Alabama, the defense got better as the game went on, especially against the run. Kenneth Darby is supposed to be one of the best running backs in the nation as well as Crimson Tide history, but he managed just 25 yards on 16 carries against UH. Alabama ran for 125 total, and just 22 in the second half. The Tide did roll up 253 yards passing, but the 378 total is still below Hawaii's average yield of 438.4 last year. The best part is the UH defense came up with big stops in the fourth quarter to get the offense the ball with the game on the line. "After that first drive, the defense got together and made adjustments," Glanville said. He said the Warriors had to adjust to a formation they hadn't seen on Alabama tape, one designed to run the ball and give Tide quarterback J.P. Wilson more protection in his first start. "We saw green, and green means two tights, two backs and one wide," Glanville said. "Give them full credit. They did a great coaching job." In the first half, No. 2 tailback Jimmy Johns ran strong for UA, with 56 of his 58 yards. Inside linebacker Adam Leonard led UH with 11 tackles in his first start. Safeties Leonard Peters and Jacob Patek (in his Warrior debut) each had 10 tackles. "Adam Leonard did a great job of showing people where to line up," Glanville said. "Even though Adam didn't play much last year, he's not a rookie this year." The Warriors didn't make very many big plays until Leonard's sack that forced UA to punt with 3 minutes left. Peters forced a fumble, but the ball went out of bounds and Alabama retained possession. "I thought there were balls hanging in the air we should've gotten to. The bottom line is we had three turnovers and we didn't get any," Glanville said. "You've got to steal the ball." Injury report: The Warriors ended up down to one healthy running back, as David Farmer played most of the fourth quarter after starter Nate Ilaoa and backup Reagan Mauia got hurt. Ilaoa left the game with a concussion, but still led UH with 27 rushing yards. He also caught five passes for 49 yards. Mauia rushed three times for 15 yards and caught a 16-yard touchdown pass. He also fumbled once. Mauia left the game with two sprained thumbs. "I guess I'm punch (blocking) too hard, "Mauia said. Peters left the game briefly in the second half with bruised ribs. Outside linebacker Tyson Kafentzis missed two series with dehydration. Quarterback Colt Brennan said he "took a blast to the chest and was throwing up blood," but added "it's nothing." Especially since UH has a bye this week, none of the injuries are expected to affect the players' availability for the next game, Sept. 16 against UNLV. "This will be a normal week," Jones said. "We'll probably practice on Monday (tomorrow)." Simpson plays, Hall doesn't: Alabama outside linebacker Juwan Simpson started and made a team-high nine tackles. There was speculation that Tide coach Mike Shula would hold Simpson out of the game because of his offseason arrest on charges of marijuana possession and carrying a handgun without a license. Simpson entered a court-ordered drug program and paid $300 in fines for the weapons charge. "He gave me the nod before we went out," Simpson said. "I didn't know if I was going to get to go, but I was excited I was able to get out there and play." 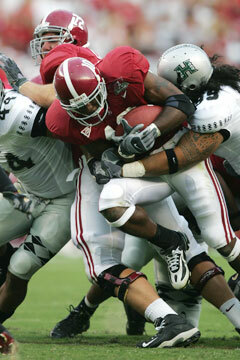 Simpson, who played in Hawaii's victory over Alabama in 2003, said the lead never felt safe. "We knew the type of team that Hawaii was. Hats off to them. They're the type of team that with a couple of touchdowns they can come back. They're a big-play team," Simpson said. Starting receiver D.J. Hall did not play. He had reportedly been involved in off-field issues that caused a suspension. One-for-one: Using the new replay rules, Hawaii coach June Jones successfully challenged what was originally ruled a 10-yard touchdown pass from Wilson to Keith Brown on the first play of the fourth quarter. The replay official ruled that Brown did not secure the ball while inbounds. On the next play, third down, A.J. Martinez broke up another pass toward Brown, and Alabama settled for a 27-yard field goal by Leigh Tiffin, making the score 25-10. The successful challenge could have had huge implications because of the four-point swing; UH later scored and, driving in Alabama territory with time running out, could've tied the game with a touchdown and 2-point conversion. Haka happens: The Warriors changed their plans and did perform a pregame haka. Some Alabama fans reacted negatively to the Maori warrior dance, but most didn't notice it because they were listening to "Sweet Home Alabama" being blared on the loudspeakers. "They didn't like it very much," Peters, one of the team's three captains, said. "But it was for us, not for them." Jones said the overall experience of playing in front of the largest crowd in UH football history was rewarding. "The crowd was fantastic. What an honor for us to play here," he said.